Use the Numerator and Denominator properties to specify the coefficients of the filter numerator and denominator coefficients. In addition to these coefficients, you can also specify nonzero initial filter states through the InitialConditions property. Create the dsp.IIRFilter object and set its properties. 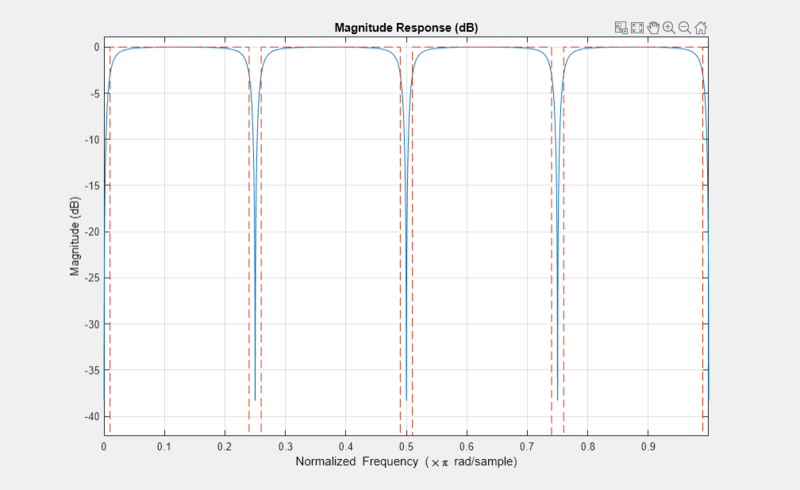 iir = dsp.IIRFilter creates an infinite impulse response (IIR) filter System object that independently filters each channel of the input over time using a specified IIR filter implementation. iir = dsp.IIRFilter(Name,Value) creates an IIR filter object with each specified property set to the specified value. Enclose each property name in single quotes. IIR filter structure, specified as 'Direct form I', 'Direct form I transposed', 'Direct form II', or 'Direct form II transposed'. Numerator coefficients, specified as a row vector. Denominator coefficients, specified as a row vector. 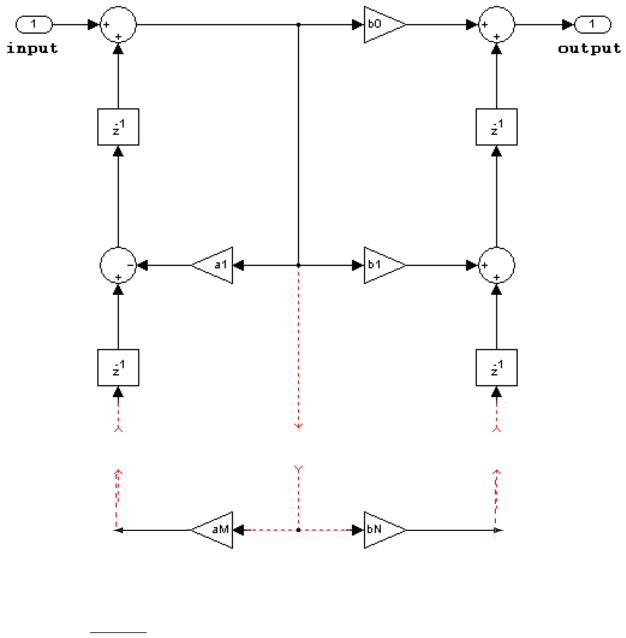 scalar –– The object initializes all delay elements in the filter to the scalar value. vector –– The length of the vector equals the number of delay elements in the filter. Each vector element specifies a unique initial condition for the corresponding delay element. The object applies the same vector to each channel of the input signal. matrix –– The number of rows in the matrix must equal the number of delay elements in the filter. The number of columns in the matrix must equal the number of channels in the input. Each element specifies a unique initial condition for the corresponding delay element in the corresponding channel. The number of filter states equals max(N,M) – 1, where N is the number of poles, and M is the number of zeros. This property applies only when you set the Structure property to 'Direct form II' or 'Direct form II transposed'. scalar –– The object initializes all delay elements on the zeros side in the filter to the scalar value. vector –– The length of the vector equals the number of delay elements on the zeros side in the filter. Each vector element specifies a unique initial condition for the corresponding delay element on the zeros side. The object applies the same vector of initial conditions to each channel of the input signal. matrix –– The number of rows in the matrix must equal the number of delay elements on the zeros side in the filter. The number of columns in the matrix must equal the number of channels in the input signal. Each element specifies a unique initial condition for the corresponding delay element on the zeros side in the corresponding channel. The number of filter states equals max(N,M) – 1, where N is the number of poles, and M is the number of zeros, respectively. This property applies only when you set the Structure property to 'Direct form I' or 'Direct form I transposed'. scalar –– The object initializes all delay elements on the poles side in the filter to the scalar value. vector –– The length of the vector equals the number of delay elements on the poles side in the filter. Each vector element specifies a unique initial condition for the corresponding delay element on the poles side. The object applies the same vector of initial conditions to each channel of the input signal. matrix –– The number of rows in the matrix must equal the number of delay elements on the poles side in the filter. The number of columns in the matrix must equal the number of channels in the input signal. Each element specifies a unique initial condition for the corresponding delay element on the poles side in the corresponding channel. 'Same as input' –– The state data type is same as the input data type. 'Custom' –– The state output data type is an autosigned numeric type through the CustomStateDataType property. State word and fraction lengths, specified as an autosigned numeric type with a word length of 16 and a fraction length of 15. This property applies only when you set StateDataType to 'Custom'. 'Same word length as input' –– The word length of the numerator coefficients is the same as the input word length. The fraction length is chosen to give the best possible precision. 'Custom' –– The data type of the numerator coefficients is the autosigned numeric type specified by the CustomNumeratorCoefficientsDataType property. Word and fraction lengths of the numerator coefficients, specified as an autosigned numeric type with a word length of 16 and a fraction length of 15. This property applies only when you set NumeratorCoefficientsDataType to 'Custom'. 'Same word length as input' –– The word length of the denominator coefficients is the same as that of the input word length. The fraction length is chosen to give the best possible precision. 'Custom' –– The data type of the denominator coefficients is the autosigned numeric type specified by the CustomDenominatorCoefficientsDataType property. Word and fraction lengths of denominator coefficients, specified as an autosigned numeric type with a word length of 16 and a fraction length of 15. This property applies only when you set DenominatorCoefficientsDataType to 'Custom'. 'Full precision' –– The object computes the numerator product output data type using the full-precision rules. These rules provide the most accurate fixed-point numerics. No quantization occurs. Bits are added, as needed, to ensure that no roundoff or overflow occurs. 'Same as input' –– The product output data type is the same as the input data type. 'Custom' –– The product output data type is the custom numeric type specified by the CustomNumeratorProductDataType property. The rounding method and the overflow action are specified by the RoundingMethod and OverflowAction properties. Numerator product word and fraction lengths, specified as an autosigned numeric type with a word length of 32 and a fraction length of 30. This property applies only when you set NumeratorProductDataType to 'Custom'. 'Full precision' –– The object computes the denominator product output data type using the full-precision rules. These rules provide the most accurate fixed-point numerics. No quantization occurs. Bits are added, as needed, to ensure that no roundoff or overflow occurs. 'Custom' –– The product output data type is custom numeric type specified by the CustomDenominatorProductDataType property. The rounding method and the overflow action are specified by the RoundingMethod and OverflowAction properties. Denominator product word and fraction lengths, specified as an autosigned numeric type with a word length of 32 and a fraction length of 30. This property applies only when you set DenominatorProductDataType to 'Custom'. 'Full precision' –– The object computes the numerator accumulator data type using the full-precision rules. These rules provide the most accurate fixed-point numerics. No quantization occurs. Bits are added, as needed, to ensure that no roundoff or overflow occurs. 'Same as input' –– The accumulator data type is the same as the input data type. 'Same as product' –– The accumulator data type is the same as the product output data type. 'Custom' –– The accumulator data type is the custom numeric type specified by the CustomNumeratorAccumulatorDataType property. The rounding method and the overflow action are specified by the RoundingMethod and OverflowAction properties. Numerator accumulator word and fraction lengths, specified as an autosigned numeric type with a word length of 32 and a fraction length of 30. This property applies only when you set NumeratorAccumulatorDataType to 'Custom'. 'Full precision' –– The object computes the denominator accumulator data type using the full-precision rules. These rules provide the most accurate fixed-point numerics. No quantization occurs. Bits are added, as needed, to ensure that no roundoff or overflow occurs. 'Custom' –– The accumulator data type is the custom numeric type specified by the CustomDenominatorAccumulatorDataType property. The rounding method and the overflow action are specified by the RoundingMethod and OverflowAction properties. Denominator accumulator word and fraction lengths, specified as an autosigned numeric type with a word length of 32 and a fraction length of 30. This property applies only when you set DenominatorAccumulatorDataType to 'Custom'. 'Same as input' –– The output data type is the same as the input data type. 'Full precision' –– The object computes the output data type using the full-precision rules. These rules provide the most accurate fixed-point numerics. No quantization occurs. Bits are added, as needed, to ensure that no roundoff or overflow occurs. 'Custom' –– The output data type is the custom numeric type specified by the CustomOutputDataType property. The rounding method and the overflow action are specified by the RoundingMethod and OverflowAction properties. Output word and fraction lengths, specified as an autosigned numeric type with a word length of 16 and a fraction length of 15. This property applies only when you set OutputDataType to 'Custom'. 'Same as input' –– The multiplicand data type is the same as the input data type. 'Custom' –– The multiplicand data type is the autosigned numeric type specifies by the CustomMultiplicandDataType property. Multiplicand output word and fraction lengths, specified as an autosigned numeric type with a word length of 16 and a fraction length of 15. This property applies only when you set MultiplicandDataType to 'Custom'. iirOut = iir(input) filters the input signal using the specified filter to produce the filtered output. The System object filters each column of the input signal independently over time. Data input that is filtered, specified as a vector or matrix. Filtered output, returned as a vector or a matrix. The size, data type, and complexity of the outpout match that of the input. For a list of filter analysis methods this object supports, type dsp.IIRFilter.helpFilterAnalysis in the MATLAB® command prompt. 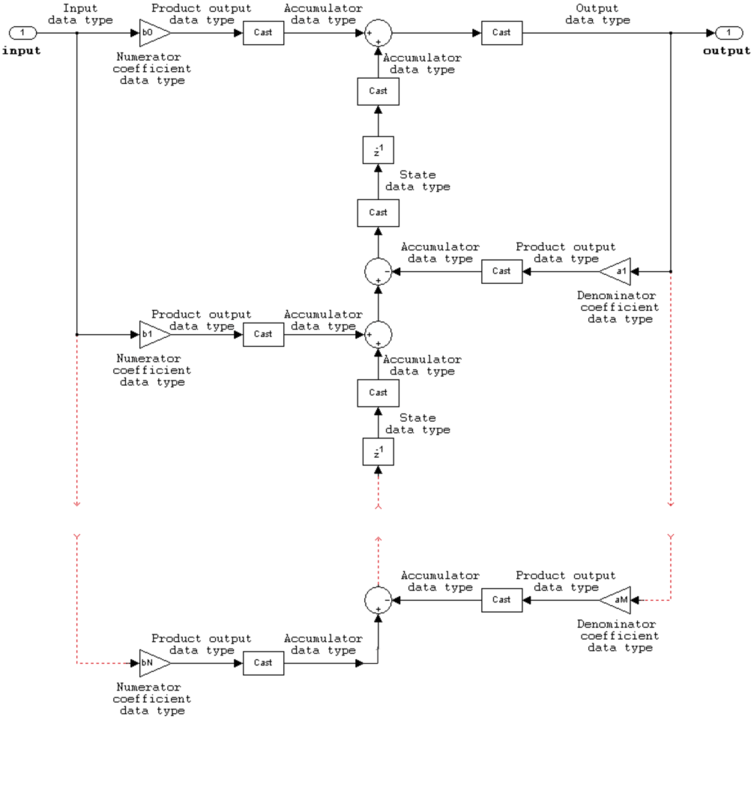 For the corresponding function reference pages, see Analysis Methods for Filter System Objects. 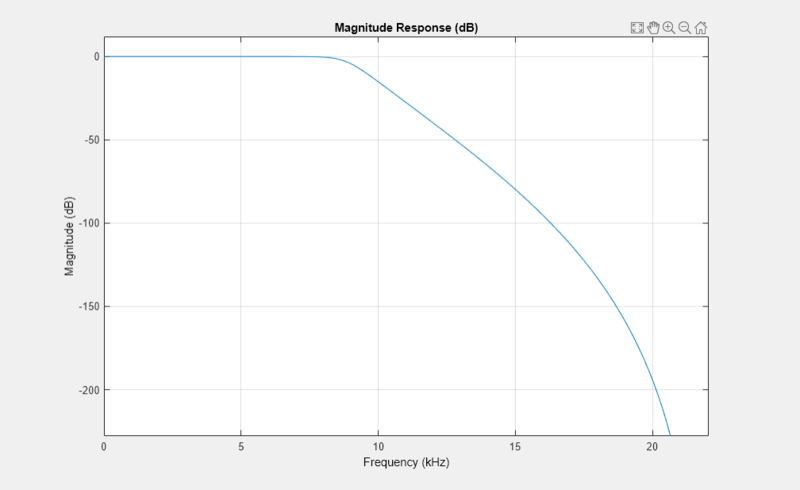 View the magnitude response of the IIR filter. 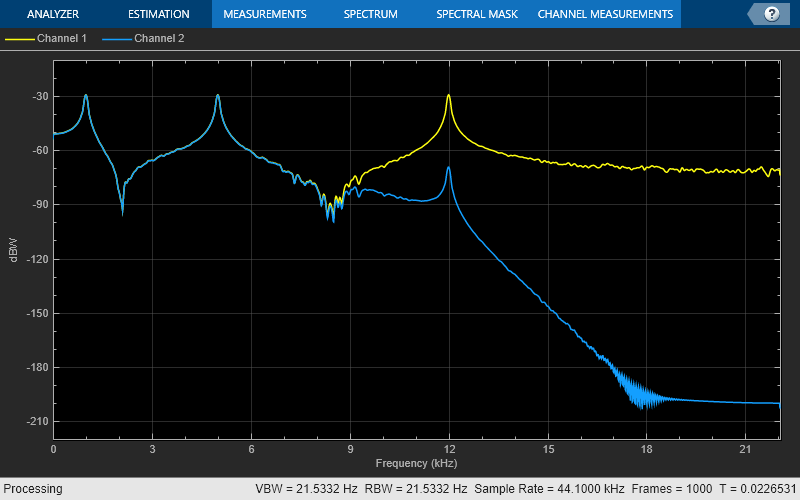 Use the Spectrum Analyzer to display the power spectrum of the output signal. 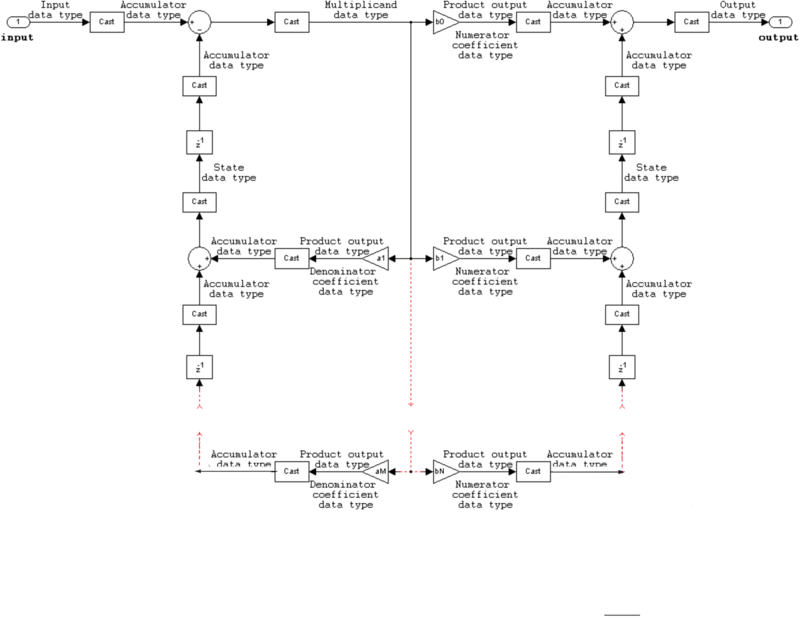 This example shows the two ways of designing an IIR filter. Design the filter using fdesign and design. Design the filter using filter coefficients. Only the Numerator and Denominator properties are tunable for code generation. The dsp.IIRFilter System object supports the following filter structures. 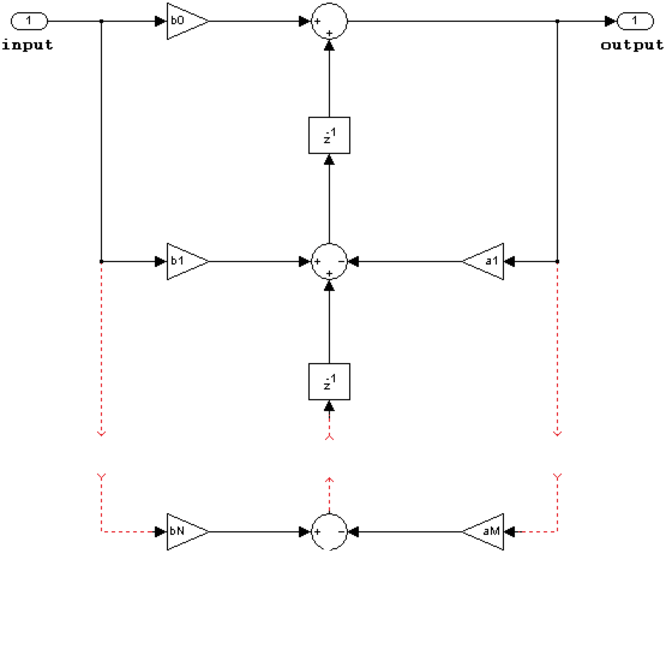 The diagrams in each section show the data types used in the filter structures for fixed-point signals. You can set the data types using the fixed-point properties of the object. Inputs can be real or complex. Numerator and denominator coefficients can be real or complex. Numerator and denominator coefficients must have the same complexity characteristics. When the numerator and denominator coefficients have different complexities from each other, the object processes the filter as if two sets of complex coefficients are provided. The real-valued coefficient set is treated as if it is a complex vector with zero-valued imaginary parts. The State data type cannot be specified for this structure. Doing so is not possible because the input and output states have the same data types as the input and output buffers. States are complex when either the input or the coefficients are complex. States are complex when either the inputs or the coefficients are complex.